Anyone who has shopped at a Sephora, MAC, or similarly-priced store knows how much a large eyeshadow palette can cost. It can be hard to justify buying one for just a few colours, and let’s be real: Most of the time, especially for themed palettes, you’re only going to end up using half the shades at most. Because of all this, I avoid buying big eyeshadow palettes and stick to singles or my Urban Decay Naked Basics palette, which is far from exciting or festive. They’re portable and useful, which is what I want—but this fall I wanted to mix things up a bit while keeping things cheap. e is the perfect budget option for your fall makeup looks. The 16-shade palette is mostly made up of shimmer shades and glitter shades in orange, yellow, green, pink, and brown tones—all the right shades for autumn. To help ground your eyeshadow looks, it also has five mattes: two browns, a light cream, a vivid red, and a deep burgundy. This range—especially the brown and red toned shadows—is very easy to work with and combine in various ways. If these shades aren’t your cup of tea, the essence palette Fairy Wings and Magical Things is filled with pastel blues, purples, pinks, and oranges. Another palette, I’m With the Band, has cool-toned blues, purples, and other dark colours. Of course, the pigmentation isn’t as strong as you would find in a high-end palette, but the results are still very pretty. The colours also last a pretty long time; I haven’t experienced fading throughout the day when I wear any of them. I haven’t used an eyeshadow primer, but if you own one then I would recommend using it to make the colours even more vibrant. The palette itself is pretty small—about the size of a cell phone. A strong magnet keeps the two sides shut, so you don’t have to worry about it opening itself up. Overall, it’s the perfect packaging for me since I can keep it in my makeup bag without sacrificing too much space to it. It’s also very cute, with doodles of spices covering the outside and spice- and autumn-themed puns for the colour names. 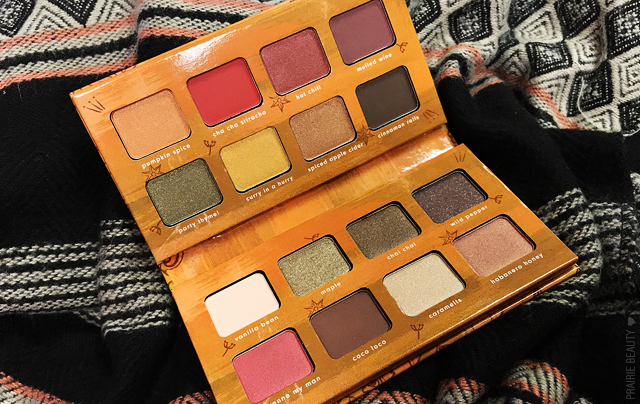 At only $12.99 and with 16 shades, this is a great palette to diversify your colour choices and warm up your eyes this fall. You can find essence products at many drugstores. The prices should be uniform, barring sales, since the company sets them itself. Go out and grab yourself some eyeshadows to get you through the rainy months, plus give their other products a shot as well—I haven’t yet tried anything I didn’t like.